Li-Chiang Chu, BA '64, MS '67, was an ardent and generous supporter of the Department of Nutritional Sciences and Toxicology. She provided the cornerstone gift that helped the department renovate the ground floor of Morgan Hall and, in the Campaign for Berkeley, she funded a Hewlett Endowed Chair in Nutritional Sciences and Toxicology—The Ruth Okey Endowed Chair. 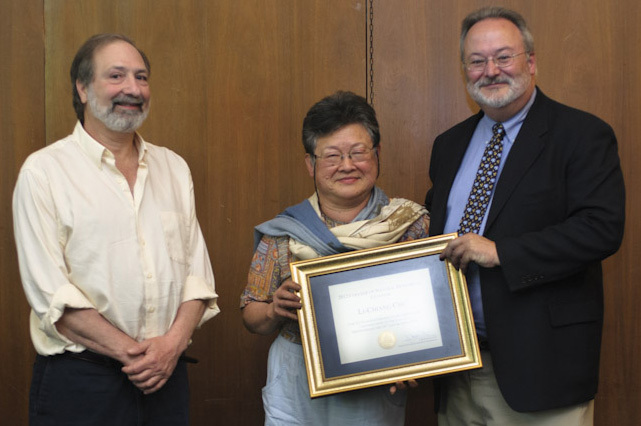 Here she is pictured receiving the CNR Citation, the College's highest honor for an external supporter. Li also served on the UCB Foundation Trustees and was a loyal alumna and supporter of the Berkeley Student Cooperative. Before she passed away, she committed to establish yet another legacy fund in the Department—the Li Chiang Chu Graduate Fellowship as part of the Berkeley Endowments to Attract and Retain Graduate Students (BEAR GradS) program through the Graduate Division. Li was a loyal friend with a humble sensibility and an extraordinarily generous spirit. She passed away on January 25, 2017 after a courageous battle with cancer. We are grateful for commitment and dedication to the department.